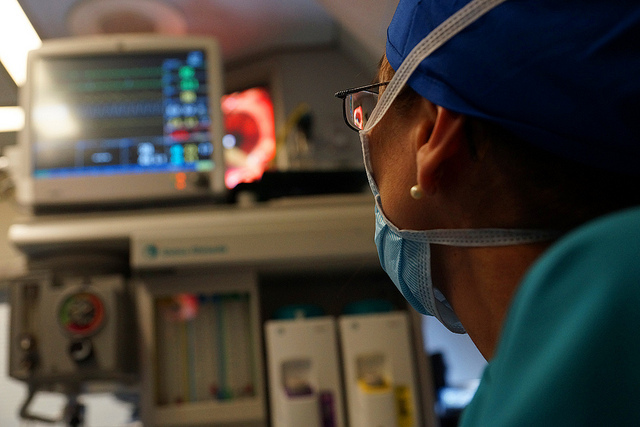 New technology could make one of the best-paid medical specialties obsolete. Anesthesiologists, usually the last voice you hear before falling into a deep sleep before surgery, have long been trusted to give just the right amount of potent medications to protect patients from the pain of surgery and lethal overdose. The Sedasys anesthesiology machine is being marketed as a device that can do all that and more, according to a Washington Post story. Johnson & Johnson says its machine may actually be safer for patients because it goes off hard vital stats, not a feeling or hunch of what a patient can sustain. The U.S. Food and Drug Administration approved the device in 2013. The rollout has been deliberately cautious for a device that hints at the future of health care, when machines take on tasks once assumed beyond their reach. Anesthesiologists — who train for four years after medical school and earn a median annual salary of $277,000 — have lobbied against the machine, according to the Post. Putting someone to sleep is an art, they said. Johnson & Johnson has made some concessions to appease the doctors and the FDA. [The company] won approval by agreeing to have an anesthesiology doctor or nurse on-call in case of emergencies and to limit use to simple screenings such as colonoscopies and endoscopies in healthy patients. “The indication is very narrow, which is comforting to anesthesiologists,” Paul Bruggeman, Sedasys general manager for Johnson & Johnson, said in an interview. The Post reports that 14 million colonoscopies are done every year. Most patients request to be put under because of discomfort caused by the routine procedure. The story compares the sedation cost: about $2,000 for an anesthesiologist and $150 to $200 for the machine. The American College of Anesthesiologists formed a committee to address issues related to the Sedasys machine. Committee co-chair Rebecca Twersky at the SUNY Downstate Medical Center, and colleagues said they doubt the machine will eliminate the specialty. “Clearly this is an example of disruptive innovation,” Twersky said. Reach Halle Stockton at 412-315-0263 or at hstockton@publicsource.org. Follow her on Twitter @HalleStockton. The Affordable Care Act [ACA], a 9-year-old overhaul to the U.S. health care system, is intended to make health insurance accessible for everyone by expanding Medicaid and making insurance easier for individuals to buy without an employer. Since its passage and a 2015 expansion of Medicaid, Pennsylvania saw big jumps in the percentage of residents covered by insurance. But there are significant gaps.